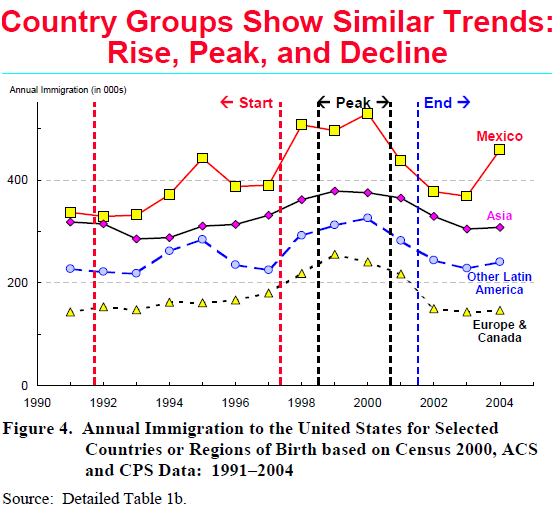 Different types of immigrants (grouped for example by legal status, country of origin or racial/ethnic composition) tended to have similar patterns of change through the upward trend and the subsequent downturn. However, some experienced different trends and certainly not all groups changed at the same rate. Consequently, the changing levels of immigration over the past decade have also resulted in some shifts in the composition of the immigrant inflow. At the end of the 1992–2004 period, the country-of-origin and racial/ethnic mix of the immigrant inflow was basically unchanged from the initial period, notwithstanding a changed mix at the peak. The most notable change over the period was the marked decrease in the share of immigration accounted for by legal permanent residents (i.e., legal immigrants). The mix of legal and unauthorized migrants in the flow changed considerably from 1992 to 2004. 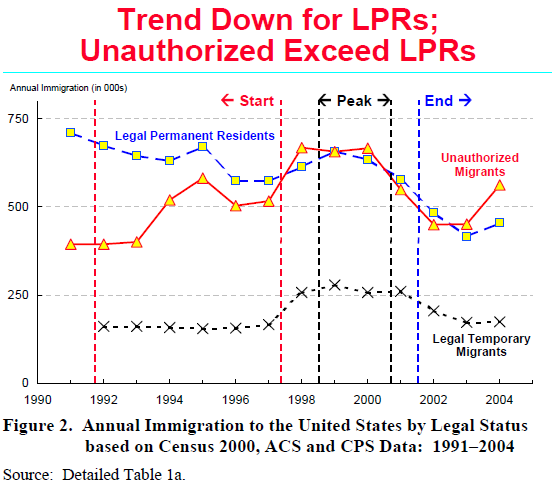 The inflow of legal permanent immigrants (LPRs, or “green card” holders) increased only very slightly (3%) from the mid-1990s to the peak around 2000. On the other hand, annual arrivals of both unauthorized migrants and legal temporary migrants (or “legal nonimmigrants”) increased by substantially higher rates. The increase to the peak for unauthorized migrants was 36% and for legal nonimmigrants, 68% (Summary Table A and Detailed Table 1a). During this period, immigration laws governing admissions did not change in any significant way to affect the number of new arrivals,1 so it is not surprising that the number of legal immigrants did not increase when the other two groups did. Moreover, the very large number of immediate relatives of immigrants who acquired legal status under the Immigration Reform and Control Act of 1986 (IRCA) accounted for a large number of both new arrivals and status adjustments beginning in the early 1990s. By the end of our observation period, the pool of potential immigrants in this group had become smaller. By 2001, increased security requirements leading to processing delays and shrinking ceilings for refugee admissions resulted in fewer admissions of LPRs. In the case of nonimmigrants, the increase during the peak period was fueled, in large part, by an increased demand for temporary workers, especially high-tech workers, and was facilitated by a large increase in the number of visas available. For unauthorized migrants, heightened demand was almost certainly a large factor in the increase as this period coincided with heightened efforts by the federal government to control illegal crossings of the Southern border. After 2000, annual levels in all three major categories of legal status groups (legal immigrants, unauthorized migrants and legal nonimmigrants) decreased at roughly equal rates— by about 30%. But, because legal immigration had increased less in the run-up to the peak, it ended up at considerably lower annual levels than it had been in the mid-1990s, both in absolute and relative terms. By 2004, the number of legal immigrants arriving in the U.S. was about 30% below the levels of the mid-1990s. While legal immigrants accounted for about five in ten of all new arrivals before the peak, they represented only about four in ten afterwards. For unauthorized migrants, the reverse is true; they represented fewer than four in ten new immigrants before the peak and almost five in ten afterwards. Moreover, in absolute numbers, the flow of legal immigrants had been significantly larger than the flow of unauthorized immigrants in the mid-1990s. Both groups arrived in roughly equal numbers during the peak and immediately afterwards, but, by 2003 and 2004, more unauthorized migrants than legal immigrants arrived each year. The annual numbers of legal immigrants arriving since the peak is actually lower than it was in the mid-1990s while the number of unauthorized migrants in the annual inflow has returned to roughly the same levels. The racial/ethnic composition of the immigrant inflow was almost identical at the end of the 1992–2004 period as at the beginning (Detailed Table 1a). But, during the peak period of 1999–2000, the representation of white2 immigrants was higher and of Asians lower than either before or afterward. With the exception of a few isolated years, Hispanics made up roughly the same share of annual immigration throughout the entire period—just about half of annual inflows. 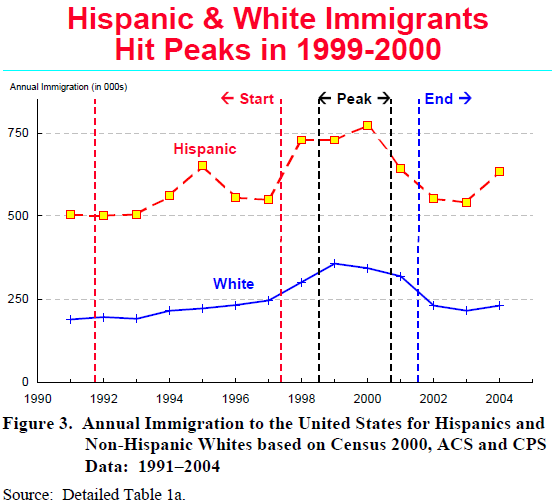 Thus, the percentage increase to peak and decrease from the peak for Hispanics was about the same as the overall rates of increase and decrease (Summary Table A and Detailed Table 1a). White and Asian immigration moved in opposite directions relative to one another during these periods. White immigration increased by the highest percentage to the peak—about 60%; Asian increase was the smallest—19%. The reverse was true for the decrease from the peak as white immigration decreased most rapidly and Asian the least. As a result, the white share of incoming immigrants was higher at the peak than it had been previously, but by 2002– 2004 the overall racial distribution was essentially identical to 1992–1997. The differences in patterns of change for racial/ethnic groups reflect underlying legal status differences among the race groups and how the changes in admission and arrival patterns by status (described above) played out over the 1992–2004 period. Asian and European countries account for very large shares of legal temporary migrants, especially students, intracompany transfers and high-tech guest workers. Because of historic declines in legal admissions from Europe and, to some degree, Canada, LPR numbers from these areas are relatively low so that the legal temporary migrants account for a large share of all immigrants from these areas. Thus, the patterns of change in white immigration are largely driven by changes in legal temporary migration. Hence, the relatively large increase to the peak and the subsequent decline. In the case of Asians, most of the migration is by LPRs and refugees, with relatively small shares of both unauthorized and legal temporary migrants. Even though migrants from Asia account for a large share of the legal temporary flow, these migrants are only a small proportion of the total flow from Asia. Thus, the patterns of change for Asian migration during the 1992–2004 period are driven largely by the changing flows of LPRs from Asia. This group did not increase a great deal to the peak, nor did it decrease much. This pattern is reflected in the changing flows from Asia. The distribution of immigrants by country of birth changed hardly at all over the 12-year period we examine (Detailed Table 1b). Mexicans accounted for roughly a third of the total throughout with the rest of Latin America contributing another fifth. Migrants from Canada and Europe accounted for nearly one seventh of the flow and the rest of the world the remainder. This rough distribution remained remarkably stable as the total annual flow underwent dramatic changes. The basic pattern of increase, peak and decline was apparent in migratory flows from all over the world although some source countries and regions experienced sharper increases and drops than others. Mexico represents by far the largest source of immigrants and is sending about 400,000 migrants each year. But Mexican immigration reached a level of at least about 500,000 per year at the peak period of 1999–2000. (See also Figure 4.) These measures, being averages of averages, tend to smooth out peaks and valleys; thus, by some measures, Mexican inflows to the U.S. appear to have exceeded 650,000 per year at the highest levels (Detailed Table 2b). While the data show a clear downturn in Mexican immigration during 2002–2003, some of the most recent data point to the possibility of a sizable increase in Mexican immigration levels by 2004, albeit to levels still lower than the 1999–2000 peaks. The data for Mexican arrivals also show a localized peak in 1995 (Figure 4 and Detailed Table 1b). It is not clear from the data we examined whether this short-lived uptick represents a problem with reporting by respondents or a real increase. Mexico did experience economic problems in 1994–1995 that could well be associated with short-term increases in migration. Moreover, this one-year increase occurs in four of the five estimation methods (Table 2b), which suggests that the increase was real and not a reporting anomaly. The fact that the one-year peak in 1995 also occurs for immigrants from other Latin American countries further supports the notion of a real increase for the year. Trends from other broad regional aggregations followed much the same trends as Mexican migration (Figure 4 and Detailed Table 1b). The rate of increase to the peak was higher for European/Canadian migrants and lower for Asians. These differences were offset by larger rates of decline from the peak for Europeans and smaller rates for Asians. These patterns lead to a virtually identical distribution of immigrants at the beginning and end of the period. The region of birth differences also largely reflect the legal status differences in composition, as discussed above for race/origin groupings. Individual countries do not necessarily adhere to the same regional patterns. For example, immigration from India registered the sharpest increase prior to the peak of any major source country—a spurt that produced a 77% increase in the annual flow, much higher than even the Mexican migration (Detailed Table 1b). This increase reflects the composition of the migration stream in that India was one of the major beneficiaries of the increased number of visas made available to high-tech workers in the peak period.